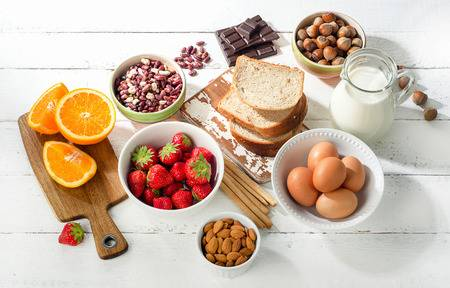 A new study from Northwestern University Feinberg School of Medicine in Chicago found that nearly 1 in 12, or 8 percent, of American children have food allergies. Further, of those children with food allergies, 1 in 5 of them will suffer an allergic reaction severe enough to wind up in the hospital. As food allergies become more common, they need to be taken more seriously to prevent children from visiting the emergency room. The most common allergies are to peanuts, milk, shellfish, tree nuts, egg, fish, wheat, soy and sesame, said lead researcher Dr. Ruchi Gupta. Peanut is the most common food allergy, affecting about 2 million children, followed by milk (1 million), shellfish (1 million), tree nuts (1 million), eggs (nearly 1 million), fish (less than a half million), wheat and soy (.4 million) and sesame (.15 million), she said. Posted in Allergy Awareness, Food allergies, Food Allergy and tagged Dr. Ruchi Gupta, Feinberg School of Medicine, most common food allergens, Northwestern University.